[HUTC601] Humphrey Hutchinson m1. ? Ellin died at Pudsey (buried at Calverley, 18th October 1638). After his 1st wife died, Humphrey married 2. (at Calverley, 19th October 1642) Elisabeth Cowling. Humphrey died at Pudsey (buried at Calverley, 30th April 1663). [HUTC621] William (baptised 1st May 1672), married Ellinor Whaittam, see later. Thomas Hutchinson was assessed with 2 hearths as the 1672 Hearth Tax at Pudsey. Thomas senior died at Pudsey (buried at Calverley, 22nd May 1697). [HUTC621] William Hutchinson (born 1672), a clothier of Pudsey, married (at Bradford, 15th September 1713) [FAWL622] Ellinor Whaittam nee Fawley, a widow of Eccleshill. Ellinor was probably the Ellin Fawley who was baptised at Cawthorne (20th June 1686), according to the International Genealogical Index, no parents shown. The page of the register is too indistinct to confirm, but there was a Robert Fawley baptised here (9th August 1683), no parents given, so there was a Fawley family here. [HUTC631] Joseph (baptised 22nd June 1718), married Hannah Farrar, see next. William (baptised at Pudsey, 6th October 1762), married (at Calverley, 18th August 1788) Martha Sharp. 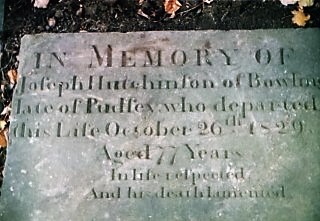 Joseph died (age 56) at Pudsey (14th August 1773, buried there 17th August 1773), and afterwards, Hannah married 2. (at Calverley, 10th April 1774) Joseph Claughton. Hannah died (age 65) at Pudsey (15th May 1786, buried there 17th May 1786). 1773 in the 57th Year of his Age. the 11th, 1777, in the 2nd Year of her Age. in the 67th Year of her Age. James (born 21st June 1802, baptised 25th July 1802), died (age 37) at Bowling (buried at Pudsey, St. Lawrence, 30th December 1839). ** The deaths of their two children Mary (Palley) and George, were recorded on their grandparents’ headstone. See previous entry. this Life October 26th 1829. Hannah died (age 86, of “old age and paralysis”) at Bowling (5th January 1842, buried at Pudsey, St. Lawrence, 9th January 1852). [HUTC652] Elisabeth Hannah Hutchinson (born 1793, daughter of Joseph), though known only as Elisabeth, married (at Leeds, July 1812) a clothier [HASN651] Thomas Harrison (born 1794, see HARRISON).